Dr. Dawn Davis is a true southern gal; she was raised in Mississippi and graduated from Louisiana State University’s School of Veterinary Medicine in 2001. She started practicing in central Maine and then made her way here to the Cape Vet Clinic and worked with Doctors Carol and Eric Robison. In 2007 she purchased the Cape Vet Clinic with Dr. Flahive. Dr. Davis enjoys nurturing her Southern roots, playing the guitar, and listening to bad 80’s rock. Dr. Flahive is a co-owner of the Cape Vet Clinic. He is a Maine native but received his degree from Louisiana State University’s School of Veterinary Medicine in 2001. After a practical internship in Washington DC, the pull of his home town was ultimately too strong and Dr. Flahive came back to southern Maine. Dr. Flahive enjoys being active in the community, playing the guitar, running, and spending time with his three kids. Dr. Hunzicker was born and raised in Ohio, and graduated from The Ohio State University. She eventually left the Buckeye State and completed an internship at the Animal Medical Center in New York and a medical residency at Tufts University. She worked in private practices in New York and Massachusetts, then came to Maine and began working at the Cape Vet Clinic in 1998. Dr. Hunzicker is an avid gardener and always takes time off at the beginning of each Spring to plant her garden, which features around 1200 flowers and plants! Dr. Fritz is originally from Hilton, New York. After graduating from the University of Findlay, she moved to St. Kitts and attended Ross University for Veterinary Medicine. She then came back state-side and completed her clinical rotations at Auburn University. Dr. Fritz enjoys spending time with her two yellow labs, Marlee and Benny, and her St. Kitts cat, Jax. She also loves spending time outdoors, enjoying Maine's beautiful weather. Dr. Linda Hornig is originally from New Hampshire. After graduating from Harvard, she spent some time in Alaska with the Fish and Game Department and then decided to go back to school. She graduated from the New York State College of Veterinary Medicine at Cornell and made her way to Maine. She worked at Cape Vet Clinic from 1995-2005 and then rejoined our team from 2009 until her retirement in 2015. Dr. Hornig enjoys technology, playing the oboe, close inspection of palm trees in winter, and all things whippet. Dr. Terry joined our team in October of 2017 after working as a mixed animal veterinarian in New Hampshire. She obtained her BA in Biology from Colby College here in Maine prior to attending Ross University School of Veterinary Medicine. Dr. Terry has special interests in ophthalmology and soft tissue surgery. Outside of work, she enjoys hiking, bicycling, running and knitting. Dr. Terry shares her home with her 3 year old Jack Russell/Whippet mix named Ollie and a 5 year old St. Kitt’s island cat named Millie. Dr. Lee Gregory graduated from Tufts Cummings School of Veterinary Medicine in 2007 with a certificate in International Veterinary Medicine. Dr. Gregory pursued post-graduate training in veterinary acupuncture and veterinary rehabilitation, obtaining certifications in acupuncture by the American Association of Veterinary Acupuncture, and by the Canine Rehabilitation institute. 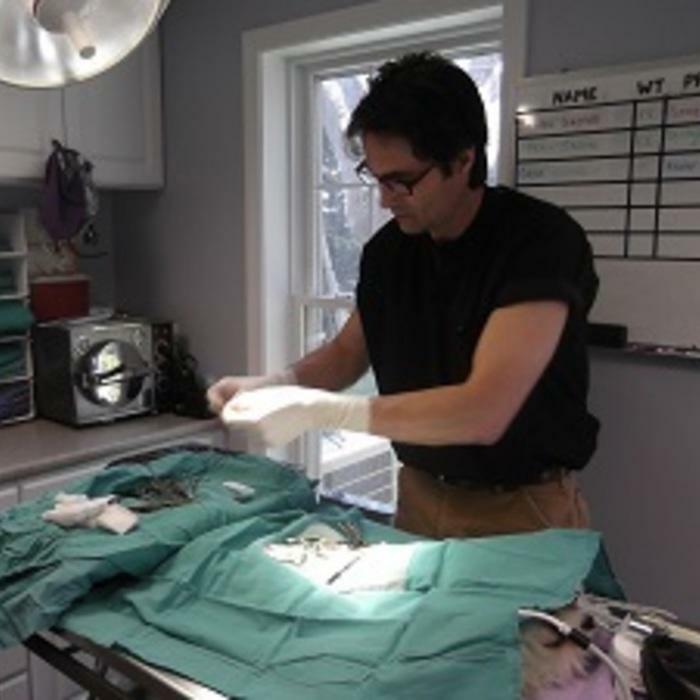 Dr. Gregory worked primarily in emergency medicine from 2008-2018, and joined Cape Veterinary Clinic as a family veterinarian in the summer of 2018. Dr. Gregory lives in Ferry Village with her husband and a gaggle of rescue dogs. When not at work, you can find her calling after her dogs at Hinckley Park, running after her dogs at Willard Beach, or practicing Brazilian Jiu Jitsu. Dr. Gregory is excited to be a part of the South Portland community, and looks forward to providing the best compassionate care for your pet family. Jacquelyn joined our team in January of 2019. A Pennsylvania native, she earned her B.S.B.A in Accounting and Finance from Kutztown University. After switching gears, Jackie is currently a senior at University of Maine-Orono, majoring in Animal Science with a pre-vet concentration. Upon graduation this spring, she plans to apply to vet in school in hopes of becoming a veterinarian. Outside of work Jackie enjoys traveling and hanging out with her two cats, Alice and Felix, and a Russian tortoise, Lily. Elissa found her way to CVC in June of 2013. 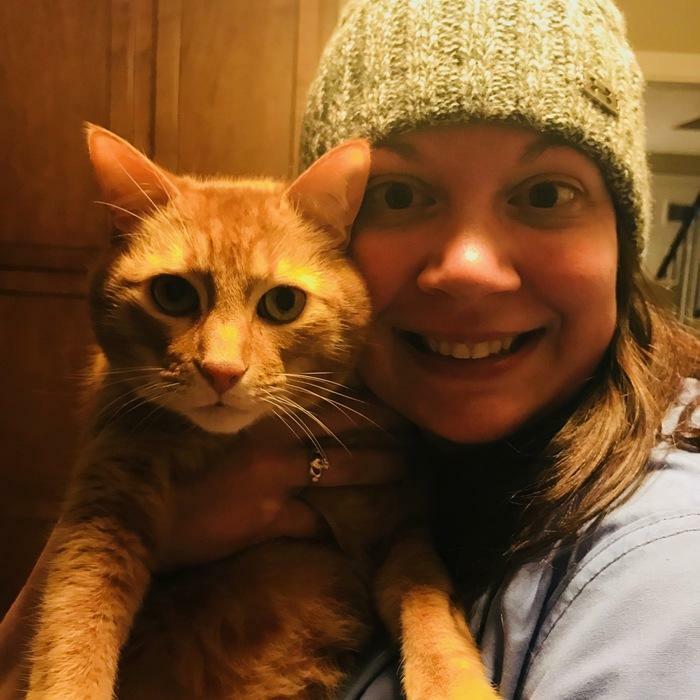 She first obtained her BS in Nursing from Husson University.. After realizing her true calling in life was to work with animals, Elissa went back to school and graduated in 2013 from UMA-Bangor with a degree in Veterinary Technology. Her favorite areas of her job here at CVC include inpatient care, surgery/anesthesia and the everyday challenges and rewards that come with caring for animals. Outside of work, Elissa enjoys weekend trips to places old and new, working at her sister’s local shop in Portland, riding her scooter, spending time with her nephew Louie and completing home projects with her husband, Ryan. They share their home with four cats and two rescue Chihuahua mixes from Georgia, Poe and Lulu. Jessica is our long-time technician. She’s been a part of our team since graduating from Wheaton College in 2006 with a degree in Psychobiology. Jessica is currently pursuing her online degree in Veterinary Technology from Penn Foster. Jessica has a special interest in veterinary dentistry and a passion for caring for wildlife and hopes to become certified in wildlife rehabilitation in the near future. In addition to loving animals, Jessica is a true artist: she paints, sings, plays instruments, and participates in local theater. Tammy has many years of experience as a technician; she joined our team in 2010. She is originally from Massachusetts and graduated from the University of New Hampshire in 1996 with a BS in Pre-Veterinary Medicine. Immediately upon joining our team, she put her love of organization to use and helped arrange our clinic in a more efficient manner. Tammy enjoys anything crafty. Tammy has a special interest in veterinary dentistry and helping her patients obtain and maintain good oral health. Samantha joined our team in May of 2017 after moving to Maine from Massachusetts. She obtained her Bachelor’s degree in Biblical Studies in 2012 and her Associate’s in Veterinary Technology/Animal Science in 2016. Sam has always been passionate about animals. From age 14 to age 20 she worked at the Sea World Pet Center in New Hampshire and joined SRH Veterinary Services in Ipswich, MA in 2015, where she worked until coming to Maine. Sam enjoys all aspects of patient care and is dedicated to providing excellent client education. Newlywed Sam and her husband Mike share their home with Joy, a Bedlington Terrier, and Jackson, a Jack Russell Terrier mix. Outside of work Sam enjoys frequenting dog parks and beaches with Mike, Joy and Jackson, as well as traveling to visit family, crafting, reading and attending church activities with her husband. Elise has been a familiar face around Cape Veterinary Clinic for several years. She was originally hired as a receptionist and assistant back when the original building still existed. Elise left for a few short years to pursue new endeavors and rejoined our team in March of 2015 after graduating from the Veterinary Technician Assistant program at nearby SMCC. She hopes to continue her education at York County Community College’s Veterinary Technician program in the near future with a goal of becoming a Licensed Veterinary Technician. Elise enjoys phlebotomy, spending time in the laboratory, and all aspects of patient care. When not at work Elise enjoys hiking in the mountains, rock climbing, anything outdoors, collecting vinyl records, enjoying her music, attending concerts and creating art. Elise shares her home with her two dogs, a Pit/Mastiff mix she calls Big Dinkis Dog and her sweet southern gal Lola, and a fish named Morty. Kat joined our reception staff in October of 2016. She is a 2013 graduate of South Portland High School and has over five years of customer service experience. Kat loves animals and helping people. When Kat’s away from the front desk, she enjoys watching the waves roll in the shore on the beach. Elizabeth, also known as Liz, grew up right here in Maine and is a Portland native. After completing her internship with us, she joined our team in September of 2015 after graduating from the Veterinary Technician Assistant program at nearby Southern Maine Community College. When Liz is not providing exceptional care for dogs and cats she spends her time creating memories and having fun with her two young girls and her fiance, as well as many friends and family members. We welcomed Alison to our team in March of 2017. She attended Maine College of Art for photography from 2004 to 2008 and worked in a professional photo studio for ten years before finding her way to Cape Veterinary Clinic. Alison has a soft spot for animals as well as helping people. When she is not working, Alison continues her passion for photography and playing with her two rescue pups, Joey and Wilson. Sarah joined the Cape Vet team shortly after finishing her internship with us back in 2015. Sarah graduated from the Veterinary Technician Assistant program at nearby Southern Maine Community College. Sarah is all about making our patients’ and clients’ experience a positive one here at Cape Vet. Sarah enjoys working in outpatient care, enabling her to interact with both the pets and their owners. Outside of work, Sarah enjoys spending time with her teenage daughter and husband. She also looks forward to weekend trips to the White Mountains in New Hampshire, shopping and antiquing. Sarah and her family share their home with their two rescue dogs, Mabel and Alice, a cat named Noni, and a hamster named Janey. In January of 2016, Kirsten completed an internship with us during her winter break from college. She missed us so much that she joined our team on a part-time basis that same summer and became a full-time technician later that fall. Kirsten’s major interest is learning about behavioral medicine and applying it to her job as a technician. She is currently enrolled online at Penn Foster to obtain her degree in Veterinary Technology. Outside of work, Kirsten enjoys all things outdoors, including hiking, archery and fishing, as well as going to the gym, listening to music, photography, playing video games and just livin’ life here in Maine. Any extra time in Kirsten’s daily life is spend with her beloved dog, Tucker. Abby joined our team in August of 2017. She obtained her Associates degree in Veterinary Technology from Becker College in 2014. Her favorite parts of the job include office calls and surgery. When not at work, you can find Abby with a good book in hand, hanging out with her friends or relaxing with her Calico cat, Bella. She also hopes to get back into horseback riding again, something she loved to do growing up. Ron joined our team in May of 2017 as the second ever Kennel Assistant in the history of Cape Veterinary Clinic. Ron is a South Portland native and recent graduate of South Portland High School. He always makes sure the cats have a toy mouse and the dogs have a comfy companion or comfortable bed. Ron hopes to become a veterinary technician in the future. When Ron isn’t walking the dogs here at the clinic, you can find him out walking his own pup, Ruby, around the Willard Beach neighborhood. In his spare time, Ron enjoys fishing, gardening, long boarding, going to the beach and spending time with his family.